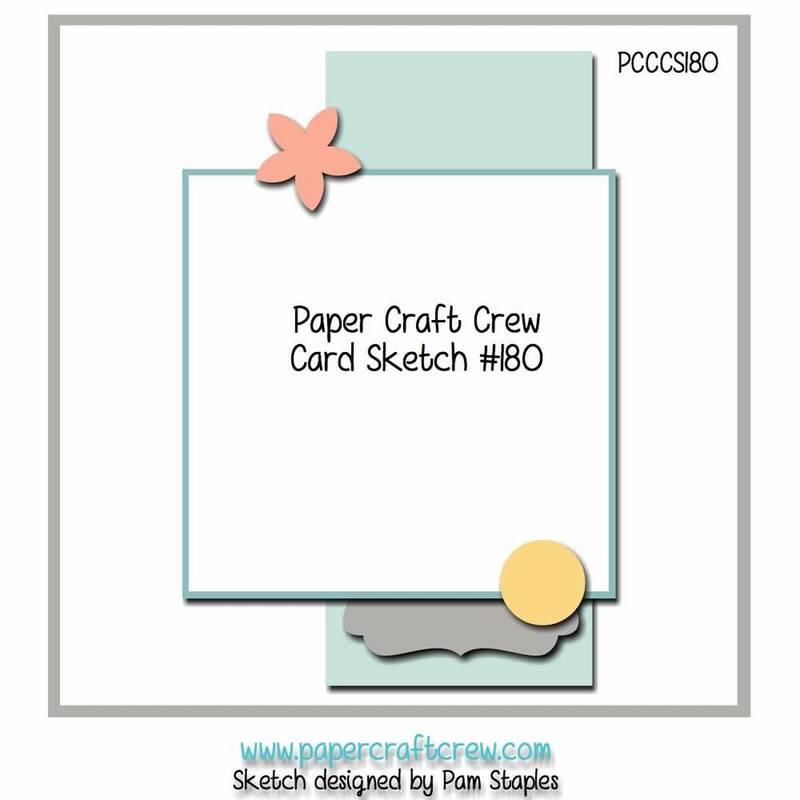 Fun Paper Craft Crew Sketch Challenge! Are you looking for a way to kick-start your creative mojo? Well, you’ve come to the right place! As a Design Team member at the Paper Craft Crew, I find that having a sketch, or some kind of prompt to start with is a great help if you’re feeling in a creative slump. Not only that, but you when you join a challenge, you have the projects made by the Design Team to spark some ideas! The most difficult part for me was deciding which of my new stamp sets to use! 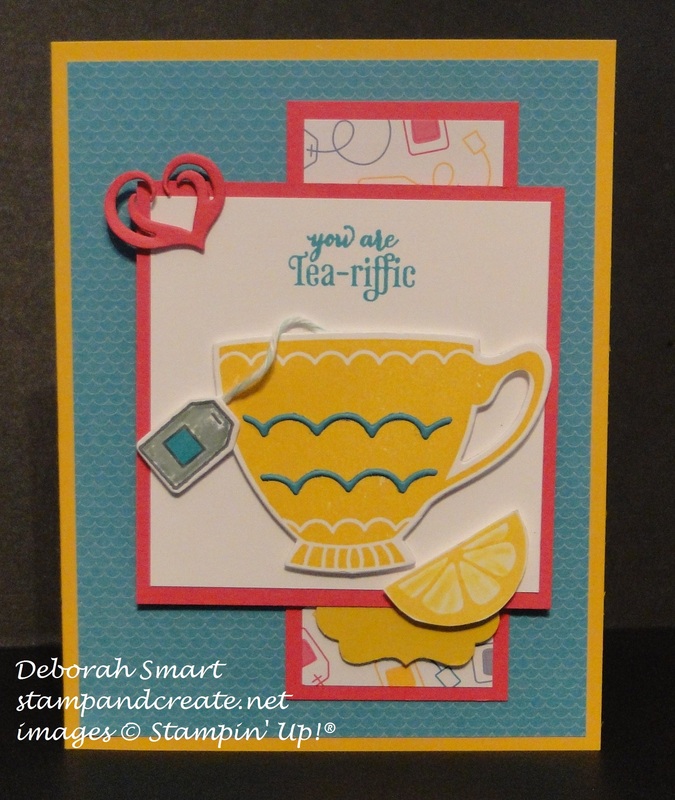 I decided to (again) use the A Nice Cuppa stamp set and coordinating Cups & Kettle Framelits dies. I have to admit – I’m so taken with this set that not only did I get the Bundle of stamp set and Framelits (‘cuz then you get 15% off! ), but I then bought the rest of the suite – DSP stack, embellishments and ribbon! Be still my heart!! Now, I didn’t use everything on this card, but you can see that I did use the stamps, framelits and DSP. I started with a card base of Crushed Curry cardstock, then layered a panel of the Have A Cuppa DSP on top. The narrow strip is from the same DSP stack, with the playful teabags, on top of a strip of Melon Mambo cardstock. On top of that is a 3 1/4″ x 3 1/4″ square of Melon Mambo cardstock, with a piece of Crushed Curry punched using the Decorative Label Punch peeking from the bottom. I stamped the cup in Crushed Curry, teabag in Basic Gray and lemon wedge in Daffodil Delight ink on a separate piece of Whisper White, and used the Framelits to die cut the tea bag and cup. I hand cut the lemon wedge, and die cut the heart from a piece of Melon Mambo cardstock. The wavy designs on the teacup were die cut from Bermuda Bay cardstock, and attached to the cup using Tombow liquid glue. All of the pieces were popped up onto the 3″ x 3″ square of Whisper White cardstock, and the sentiment stamped above the cup in Melon Mambo ink. I hope you’ve enjoyed seeing my card for this challenge – please come over to the Paper Craft Crew page to see what the rest of the Design Team has prepared for your inspiration, then be sure to join us! Create your own card based on the sketch, post it, and link up to the challenge. Did you know that you don’t need a blog to join the challenge? Nope – you can post it pretty much anywhere we can access & leave a comment for you! Thanks for spending some time with me today – I’ll be looking for you on the challenge page!